The second incarnation of the #NGAQB is well under way. You may remember my last NGAQB post, where I shared my center with you and explained my fabric choices and what I was hoping the other members of the bee would add to it. Well, from what I’ve seen posted in Instagram, I can tell you that my expectations have been more than met! I asked for improv and boy did I get it! If you haven’t been following along, now’s the time! I can tell that there are going to be some stunning quilts once the rounds are complete. In the bee, I always receive quilts from Molli Sparkles, so it was both an honour and a slight worry that I was to be the first to add to his center block. Perhaps starting block is a better word, since there’s no obligation to keep the block centered. When we started we were told and encouraged to add to all sides or add to one. As you can probably guess, this really appealed to my improv-inclined brain! Molly had used an amazing paper pieced pattern of a unicorn for his starting block. The minute I saw it I was totally blown away by his fabric choices and was so excited to dive into my own stash and see what I could find. In my mind, I wanted to create a kind of improvised forest in which the unicorn could gallop, unbridled and free. I used a lot of Kona solids in vibrant pinks and purples, along with some Anna Maria Horner, Lecien L’s Modern and Cotton and Steel. I hacked and slashed fabric before piecing it into long-ish strips, adding some freehand curved seams for interest. 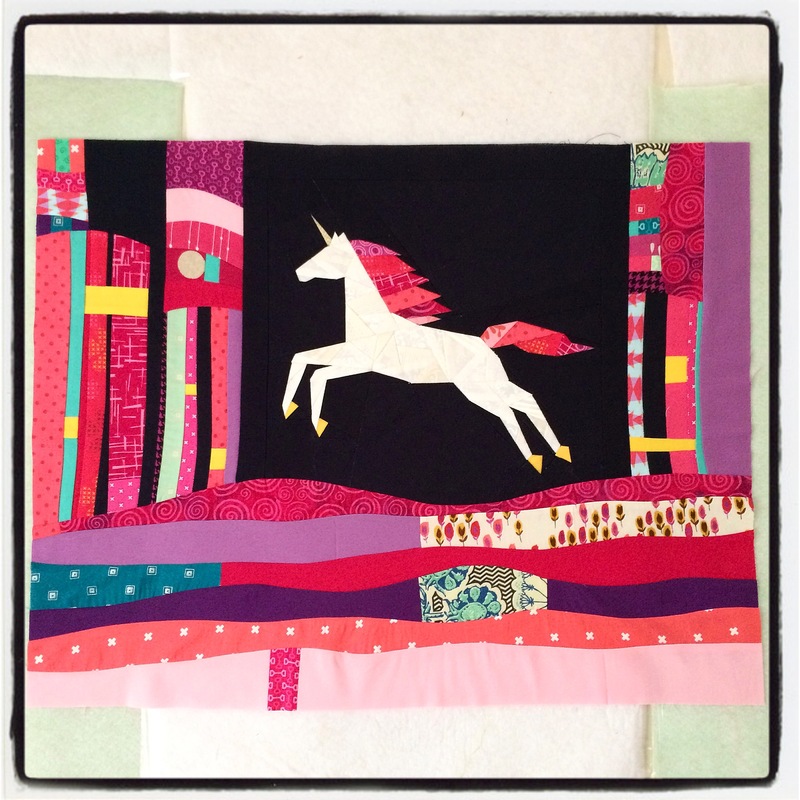 The piecing was very freeing and of the moment and I soon had enough to add to unicorn block. I decided to leave the top edge, in the hope that the next person to receive this would continue working upwards, taking inspiration from my long thin strips and adding to the magical forest feel! The next block I received belonged to Quilt Dad. Like Molli, John had paper pieced his starting block, this time a trio of feathers. Once again, I was so inspired by the colour palette and excited to see that John had used one of my all time favourite prints, a wood grain by Joel Dewberry, albeit in a tiny role. I wanted it to be the star! I had a little left in the stash and was determined to use it! For John’s block, Molly had added a first round of epic beauty! I was a little scared to continue, lest I ruin it. I took inspiration from the Totem Pole Quilt I made for a past swap. I pieced long, improv strips and attached these to the quilt log cabin style. 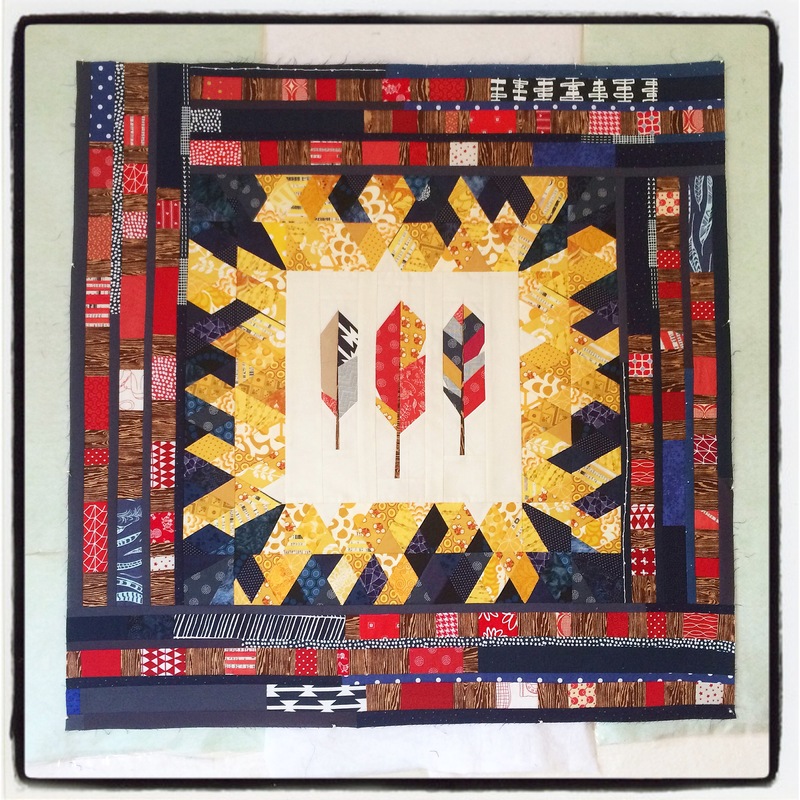 This was a real scrap-busting exercise as I had a lot of red pieces that were perfect for this, including some of the new Blueberry Park collection by Karen Lewis and some snippets that had been waiting for their moment to shine longer than is polite to mention! Fun, simple sewing for both of these blocks, and I loved every second! I’m so excited to see how these and all the other quilts in the bee evolve!